My friendship group is making an applique apron quilt for the auction at our annual quilt show. We all made two blocks. I finally finished the embellishments on mine – I kept them pretty simple, but I’m happy with the results. 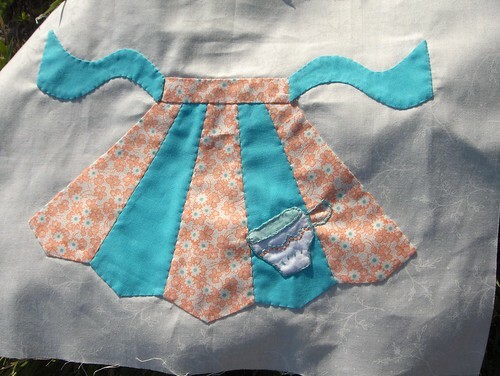 The apron patterns are from Lori Holt’s Apron Club pattern. I don’t think she has a website, but I’ve seen her patterns in a few online shops. 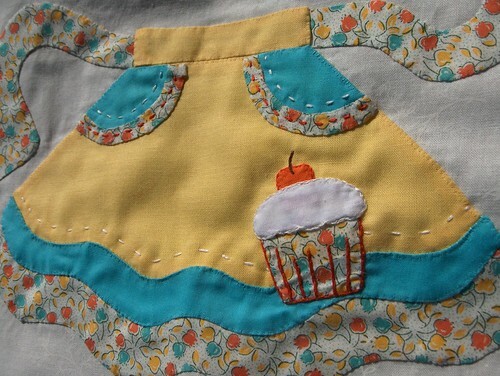 The cup and cupcake were embroidery patterns in Sublime Stitching. I decided to applique them first, then embroider over them. I had a few problems because I doubled the white fabric so my print fabric wouldn’t show through – made it hard to stitch, but I think it’s alright. Once the whole thing is assembled and it’s been washed, I know they’ll be great. I absolutely love your little aprons! Too darn cute. You inspire me, Abi! Oh my gosh, those are SO DARN CUTE!!! I really love this too! You should do a tutorial. Free charge (within10000stitches) for the first digitizing order!!! Only $3.00/1000 stitches with perfect quality for digitizing .And we Offer all-day’s services any time 24 hours turnaround,any time you need, please let us know.